This is the second post in my ongoing tutorial series. A series that follows my footsteps from preparing to finishing a miniature model. Click here to view the first steps of this process and read on to see what happens next. Since gremlins in Malifaux tend to live in swampy areas, I decided to go with the flow and toss my guys in muck and nature. I have seen quite a lot of different bases and what I originally enjoyed a lot was stuff using water effects. Glossy surfaces to depict ‘real’ water and make things look a little more realistic and offer some variety to the paints covering the model. 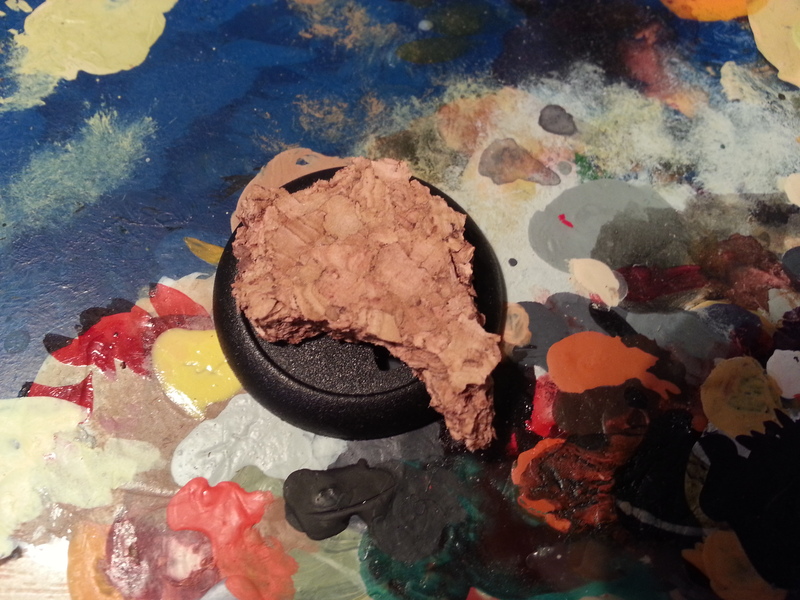 To start off I pick out a chunk of cork from a cork plate I bought. It can be rough and big, just make sure it isn’t too small for the base. 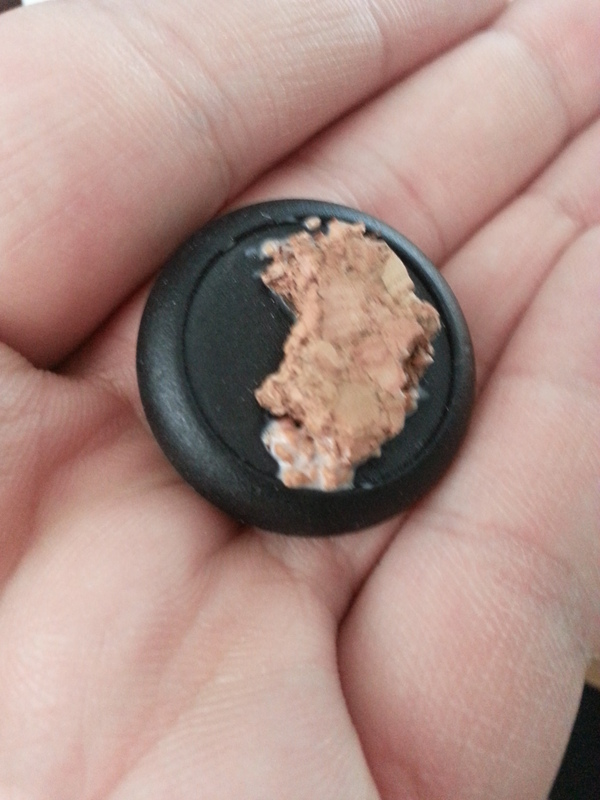 Once you have your chunk and have laid it over the base, start tearing it up to a size more suitable for the base. In this case the cork is supposed to be a piece of ground or earth that is not entirely covered by swampy fluids. So it can be rough and random. Just go for something you really like. 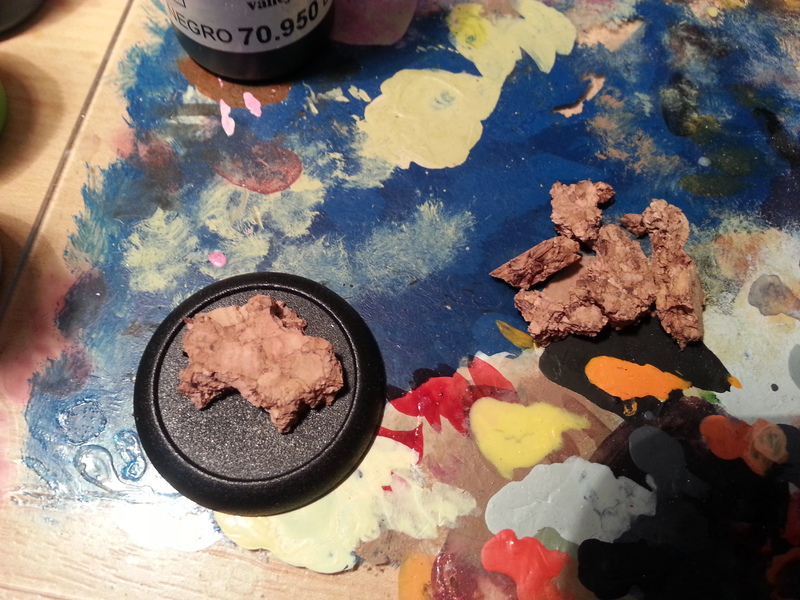 Also make sure to ‘fit’ the model on the base prior to reducing its size. You want the model to stand on the cork, so make sure it doesn’t become too small! Just remember to rip off the pieces. If you cut it, you will actually have more difficulty making it look ‘natural’ plus it is more fun ripping the shreds out of something! When you are done, your base should look roughly like this. The size difference is quite considerable. I recommend to keep the bits you ripped off and store them in some container. You can use these later for other projects. Cork can be used to make rocks and stones in varying sizes, which may be something you need for other projects! Glue the stump onto the base with some regular white glue. I used the stump to cover up the slit in the base, thus taking a bit of work off of my shoulders, since I would have to fill the gap with something else. That is what it looked like after I was finished prepping the base. 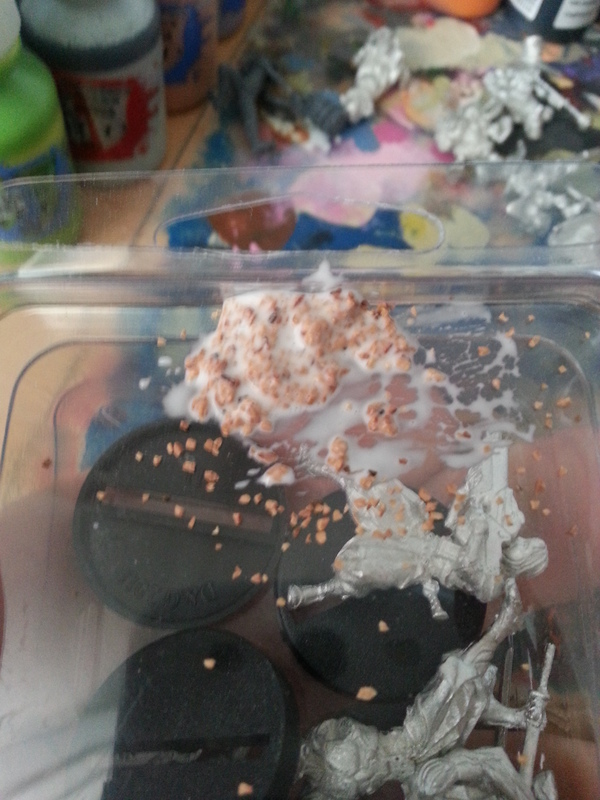 Let the glue dry over night and enjoy the next step you accomplished in making an awesome miniature! We shall see each other in the next step! Click below to view it! ← EBM Guides: How to prepare pewter models. Oh great guide again! I never thought of mixing the texture item into the glue and then applying it. I’ve been putting on glue and ‘dusting’ my product over. I really like this idea for larger pieces like rocks.